I've got quite a few photos from cbssportsline and am working on Great American Ballpark now. I will also have a Coors update soon seeing as the Dbacks are playing there right now. 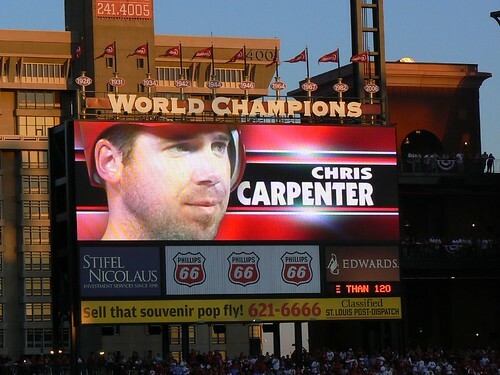 I just posted this in RaptorQuiz's opening day thread, but here's a shot of the World Champions sign and new scoreboard at Busch. By the time they took the covers off the sign the sun was going down, so the lighting isn't great. Pirate, I think the Bud Light ad you're referring to is also in Safeco, too. I think it's on the left-center wall someplace. I think that's the same as AT&T. I will get some good pictures. I can't wait to see Kauffman either. Tabascoman try to get a shot of that Bud Light ad real high resolution and close up. Kauffman's walls have been moved back, so it's back to Pirate to finish everything up. Thank you Sean. I really appreciate the effort. I will look at it tonight. im heading back to safeco tonight, i'll work on getting more ad shots around the stadium, i'll have them posted in my album later tonight, or tomorrow. Awesome remember that Bud Light Ad and the Am PM try to get them close up and focused so I can just pluck them off the photo and put them in the game. Comerica Park has gone under many changes over the Winter. I'll try to post some pictures! And I just sent Pirate an updated Citizens Bank Park with correct dimensions and a fixed left field corner. That's it for now.